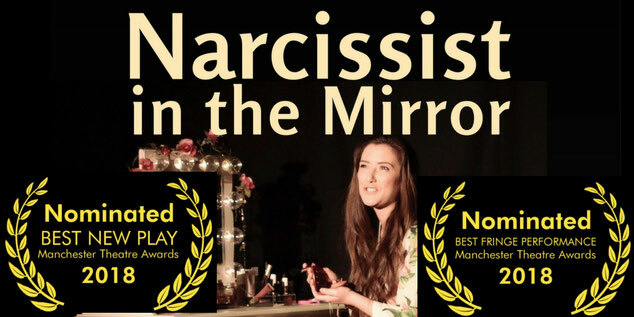 This morning it was announced that the one-woman play, Narcissist in the Mirror, which played here at the Millgate Arts Centre in October last year DETAILS, has been nominated for TWO Manchester Theatre Awards: Best New Play and Best Fringe Performance. Congratulations to Rosie Fleeshman, who wrote and performed it and to her mum, Sue Jenkins, who produced and directed it. Both have said how much they appreciated the warmth and support from our Saddleworth audience. Since being performed here, the play has gone on to form part of the PUSH festival at HOME in Manchester, where it continued to receive a very warm reception. We wish all involved the best for the upcoming Awards ceremony, which will be held on Friday 9th March at The Lowry. A full list of the nominations, including reviews of performances, can be found here.